Today, I released my hunting partner back to the wild. After five years of hunting for critters and walking through the woods together, it was her time to enjoy the natural world again. 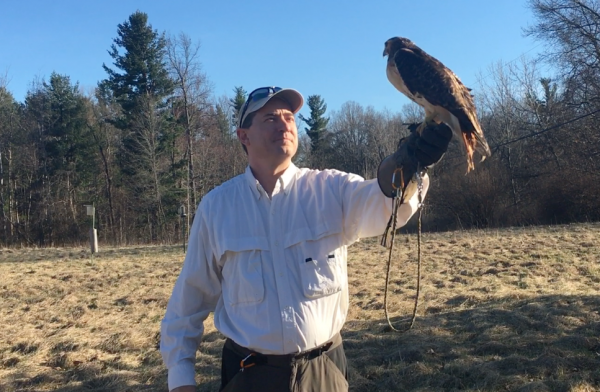 It was a bittersweet moment for us as we watched Cedar do her victory lap around the field before finding a safe perch in a pine tree for the evening. I have no doubts that she will enjoy the wilderness once again and continue to be a survivor. Here’s the Video of Cedar leaving the glove for the last time. Happy Halloween! The evening is full of tricks and treats. Cedar’s first successful TRICK was to catch a rabbit on an afternoon hunt and the TREAT was to have him for dinner. The whole team, Kelly, Kida, Cedar and myself went out for an afternoon hunt before all the spooky creatures came out in the evening. We flushed the first rabbit within the first 10 minutes and Kida was hot on the trail. She’s getting better at following along with the hunt and is definitely keyed into flushing game. Cedar gave chase after the “HO-HO-HOOOAAAH!” game call but had to pull up due to the thick underbrush. Bonus props to my lovely apprentice, Kelly, for the great assist out in the field and for the great photography! 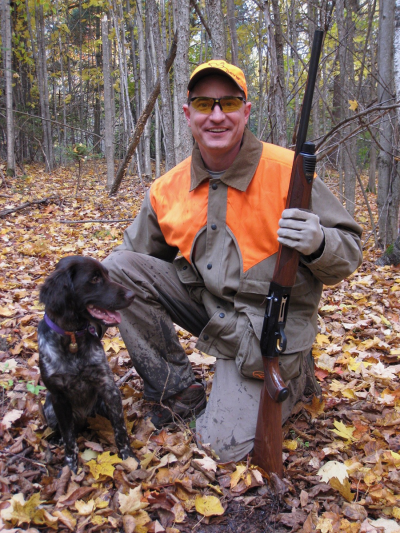 As previously mentioned in my blog, every October, we venture out in to the fall woods for a weekend of small game hunting. The family hunting tradition continues this year with an extended hunt at the cabin and with some new team members. The weather was mostly cooperative and the crisp fall air was a joy to breathe for a few days. Our hunting adventures with Cedar were good afternoons out in the field. 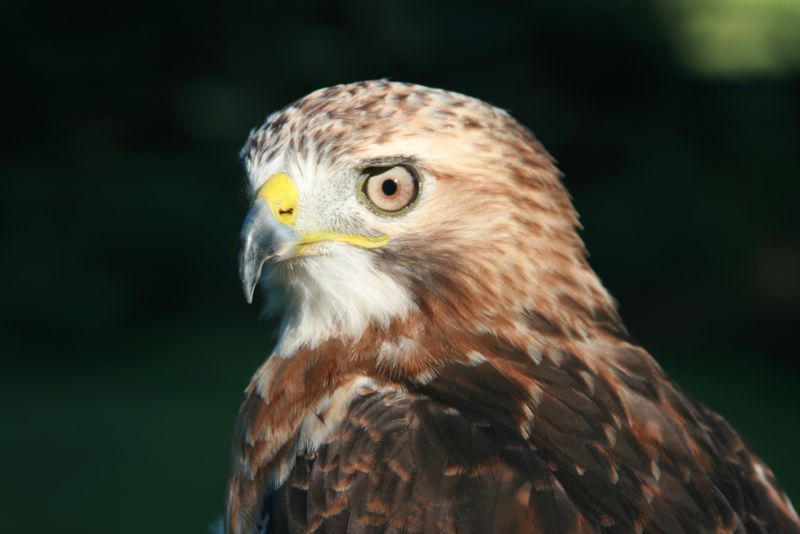 Game for the Red-Tailed hawk is scarce up here, which is why you don’t find many of them the more north you travel. 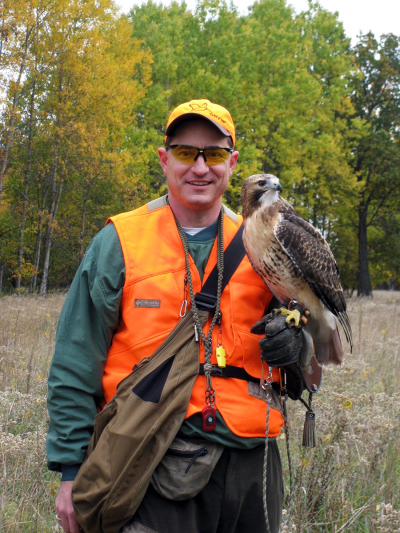 Cedars’ afternoon hunts were successful in getting out, flying, and recalling to the lure. This picture was from a new area we tried together. 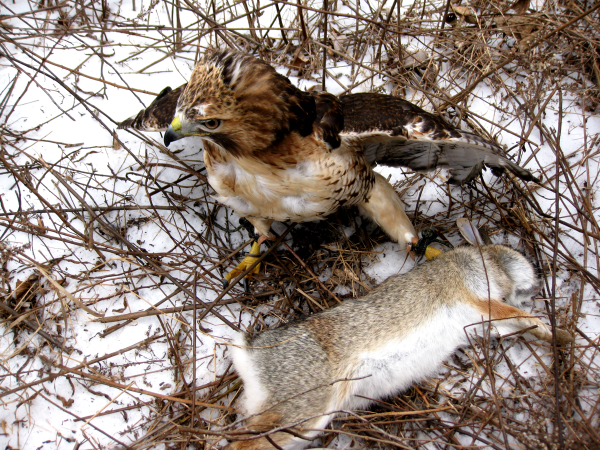 This year begins a new era in hunting on several levels. There were some additional hunters in the field that hopefully will be part of the team for many years to come. One of those new team members is ‘Kida’, our new German Munsterlander puppy. This was her first exposure to the wilderness, our hunting expeditions, and wild birds. After three days of consistent hunting, she recognized the routine and truly enjoyed the experience. While as a puppy, my expectations were exceeded by how well she did in the field. Her recall is great and her nose and strength are very strong assets out in the field. I look forward to many more years of her partnership out in the field as she develops into a great hunting dog. 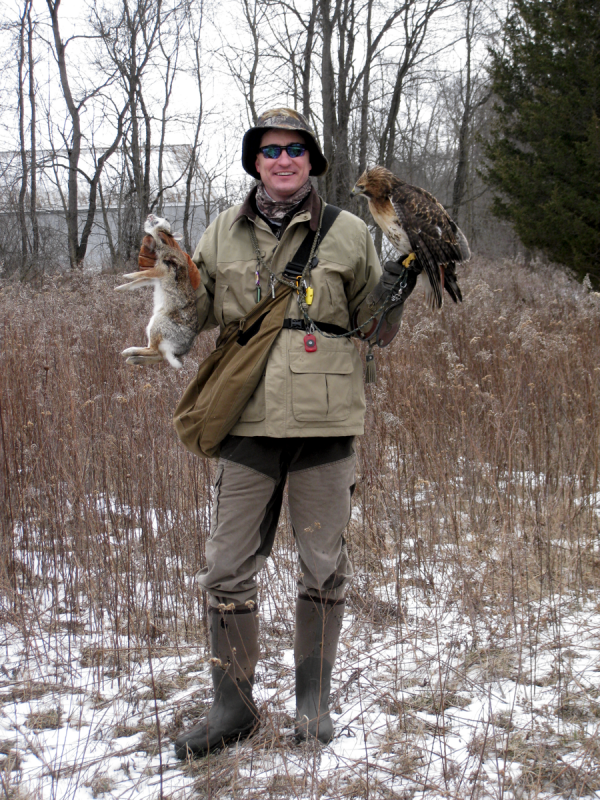 This past Sunday I had the pleasure of an all-you-can-hunt area with several other favorite personality falconers. 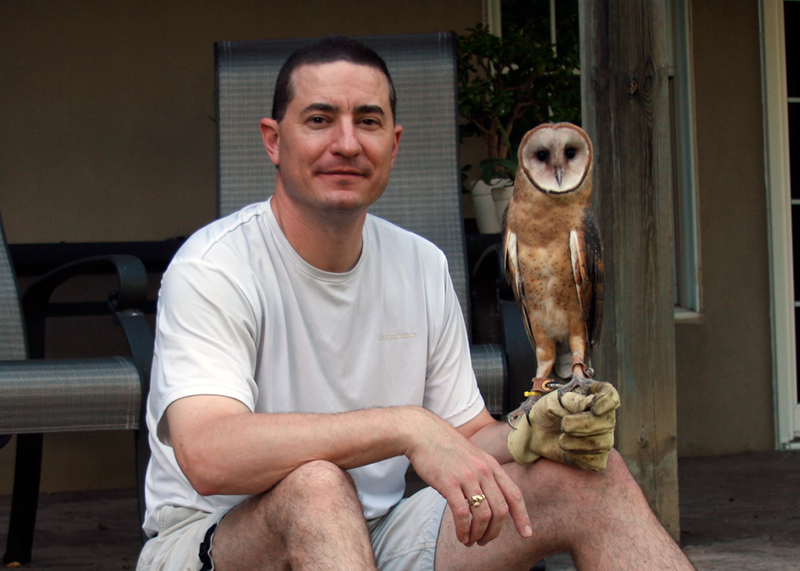 We started early in the morning to ensure a full day of falconry and time for everyone to fly. The area was large enough for each hunt to take a new, and separate area of fresh hunting ground to kick out the bunnies and squirrels. Cedar was the second hunt of the morning, and it’s always a challenge to hunt her when you change up the normal routine. Usually we hunt in the afternoon at close places around the house, and that provides for a good routine: empty crop, no food for a day, and an urgency to hunt before the dark. So, when we get up early and begin the hunt around 10:30 am, that tends to change up the routine that requires a little more patience. Cedar was put up in a tree, and took several minutes to cough up her pellet from the previous day. 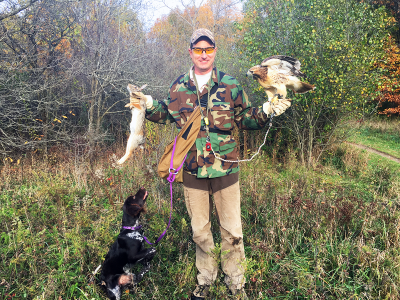 Raptors usually produce a casting several hours after their last meal, so in this case, she hadn’t cast yet from the previous day and needed to do so before hunting. She usually takes a few minutes in her first tree before hunting anyway, but today it took *extra* time. Once that nasty business was out of the way, she took to a higher perch and settled in again, but higher, and with a commanding view of the surrounding area. The first rabbit flush was a quick one, and due to her height, and the obstructing tree branches, she missed a quality slip. With the additional people in the field, it was also possibility of confusion for her and missed where the action was. Not to be deterred, she moved up in the field ahead of the group and proceeded to await the next flush. The second flush was not too far afterwards, and she took a good swipe, but pulled up and took another perch out of sight. At this time, I’m thinking that the early morning routine is too unsettling and the additional folks in the field are too much for her. I pull out the lure to end the hunt once I found her another 50 yards away up in a tree. I pulled out the lure right under her, and she wouldn’t come down. She’s never refused the lure before, so this was perplexing. She jumped from her branch and wasn’t coming in my direction. She took a wing-over right into a bush and crashed the brush hard. I was rewarded with the success sound of her connecting with a bunny. I laughed at the disobedience for a second and immediately ran to give the assist on her capture. I quickly got a good picture and rewarded her for her efforts! The remainder of the day was followed by two other successful hunts for the other falconers and we ended our afternoon with gratitude for our hosts for the day. Cedar catching the evening sun just right. Summer evenings in the backyard are enjoyable with the birds. Cedar caught the evening sun just right tonight on a clear night in August. Mystic hanging out and getting some manning outdoors. Mystic and I getting in some evening manning time with Family. Photo credits tonight go to my boys.